AVS Video Converter enables you to burn a home video DVD to playback in your home DVD player from all modern video formats. The integrated DVD burning engine and the widest range of supported video formats make AVS Video Converter a perfect tool to create personal DVD videos. Just follow these few steps listed below. Click the To DVD button on the Formats tab of the Main Toolbar. In the list of video disc types (Profile field) select one of the preset profiles. You can edit the files to burn. By clicking the (+/-) buttons you can add or remove files from the list. Using the Arrows you can change the sequence of files. Place the mouse cursor within the Timeline where a chapter should start and click the Add Chapter button on the Timeline Toolbar. If you want to delete some chapters select the necessary one clicking it with the mouse. Then use the Remove Chapter button at the Timeline Toolbar or right-click this chapter and select Remove Chapter from the express menu. To delete all chapters use the Remove All button. 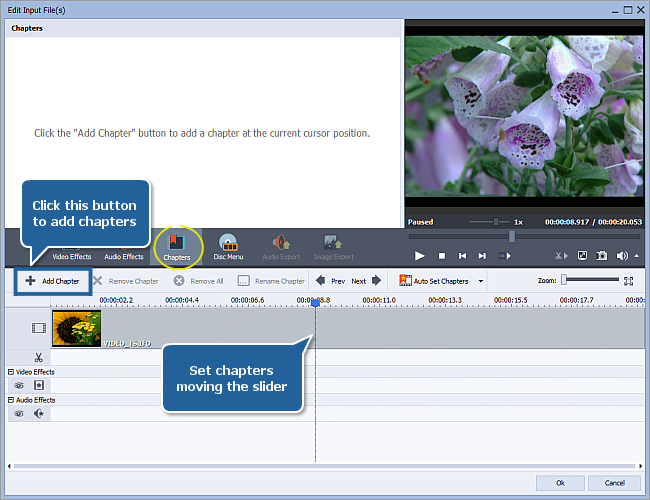 After all the chapters are added click the Disc Menu central button to start editing your DVD Menu. Select one of the Disc Menu Styles by double-clicking it or selecting the Apply Menu Style option from the right-click menu. Switch between the Main Page and the Chapters page in the Preview Area. 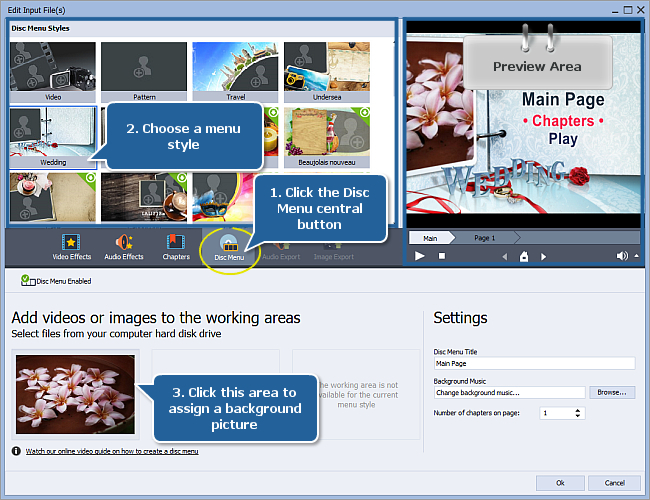 To assign your own background pictures left-click the Working Areas (if they are available for the selected menu style) at the bottom of the Edit Input File(s) window, select the desired image or video file in the opened window and press the Open button. In the Settings section of the Edit Input File(s) window you can change the Disc Menu Title, assign your own Background Music or set the Number of chapters on page using the appropriate controls. After you add all the chapters and when you are satisfied with the result, click the Ok button to close the Edit Input File(s) window and start converting your video. After you have set up all the conversion parameters, hit the Convert Now! button to start conversion.